Engineers at the University of New South Wales (UNSW) have created a novel solar cell configuration that has pushed the conversion efficiency of sunlight-to-electricity to as high as 34.5%, setting a new world record for unfocused sunlight and bringing us closer to the hypothetical limits for such a module. Dr Mark Keevers with one of the spectrum splitting, four-junction mini-modules developed at UNSW (credit: Rob Largent/UNSW). 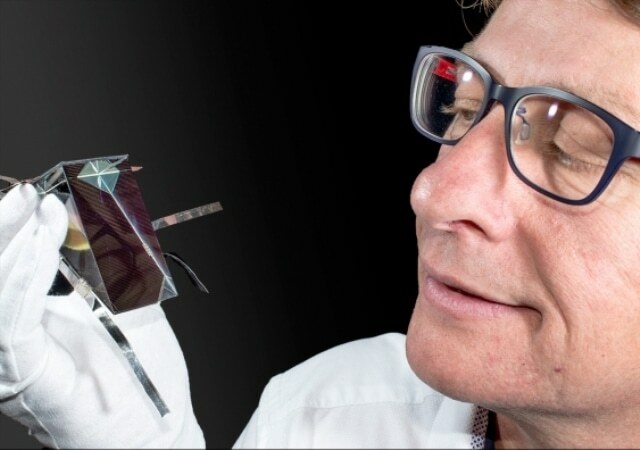 Dr Mark Keevers, Senior Research Fellow, and Professor Martin Green, Director of UNSW’s Australian Centre for Advanced Photovoltaics set the record, utilizing a four-junction mini-module that harnesses the highest amount of energy from the sunlight. Measuring 28 cm2 and integrated into a prism, the device achieves this efficiency by splitting the inward bound rays into four bands, through a hybrid four-junction receiver to obtain even more electricity from individual sunlight beams. The US National Renewable Energy Laboratory validated this latest result, which is nearly 44% better than the record previously set by the US-based Alta Devices which achieved an efficiency of 24%, but over a greater surface area of 800 cm2. This encouraging result shows that there are still advances to come in photovoltaics research to make solar cells even more efficient. Extracting more energy from every beam of sunlight is critical to reducing the cost of electricity generated by solar cells as it lowers the investment needed, and delivering payback faster. The result was obtained by the same team that set a new world record in 2014 by attaining a electricity conversion rate of more than 40%, utilizing mirrors for light concentration – a method called concentrator photovoltaics (CPV) and then splitting out different wavelengths. However, the new result was obtained by utilizing normal sunlight without concentrators. What’s remarkable is that this level of efficiency had not been expected for many years. A recent study by Germany’s Agora Energiewende think tank set an aggressive target of 35% efficiency by 2050 for a module that uses unconcentrated sunlight, such as the standard ones on family homes. So things are moving faster in solar cell efficiency than many experts expected, and that’s good news for solar energy. But we must maintain the pace of photovoltaic research in Australia to ensure that we not only build on such tremendous results, but continue to bring benefits back to Australia. Green explained that the new study on photovoltaics has already created flow-on benefits of over $8 billion to Australia. Efficiency gains alone, which were made possible by UNSW’s PERC cells, are predicted to save as much as $750 million in the generation of domestic electricity in the next 10 years. Invented at UNSW, PERC cells are now turning out to be the commercial standard at a global level. The UNSW device integrates a triple-junction solar cell on one side of a glass prism and a silicon cell on the other side. Distinct bands of the inward bound sunlight are targeted by the triple-junction cell, using three layers: indium-gallium-arsenide, indium-gallium-phosphide, and germanium. When sunlight travels via individual layers, each junction extracts energy at its most efficient wavelength, while the portion of the light that is not used travels through to the subsequent layer, and so on. A part of the infrared band of inward bound sunlight, that is not used by the triple-junction cell, eventually filters out and bounces on the silicon cell, extracting almost all of the energy from each sunlight beam bombarding the mini-module. There’ll be some marginal loss from interconnection in the scale-up, but we are so far ahead that it’s entirely feasible. The hypothetical limit for such a mini-module is believed to be 53%, which places the UNSW efficiency result two-thirds of the way there. However, this type of multi-junction solar cells is not likely to be used on the rooftops of offices and homes for a while, because these cells will require more work to produce, and would cost more than that of typical crystalline silicon cells with one junction. Nevertheless, the UNSW team is exploring numerous ways to bring down the manufacturing challenges and manufacture low-cost multi-junction cells. Conversely, the spectrum-splitting method is suitable for solar towers, like the ones being produced by RayGen Resources in Australia. These towers utilize mirrors to concentrate sunlight, which is directly changed into electricity. The Australian Renewable Energy Agency (ARENA) has remarked $1.4 million grant for this study. According to the company’s CEO Ivor Frischknecht, the achievement shows the significance of supporting early-stage technologies focused on renewable energy. Australia already punches above its weight in solar R&D and is recognised as a world leader in solar innovation. These early stage foundations are increasingly making it possible for Australia to return solar dividends here at home and in export markets – and there’s no reason to believe the same results can’t be achieved with this record-breaking technology. He observed that the UNSW researchers are working with RayGen, another ARENA-supported company, to study how the sophisticated receiver can be deployed at concentrated solar PV power plants. Other partners who are involved with UNSW are the U.S. National Renewable Energy Laboratory and Trina Solar, a PV module manufacturer.